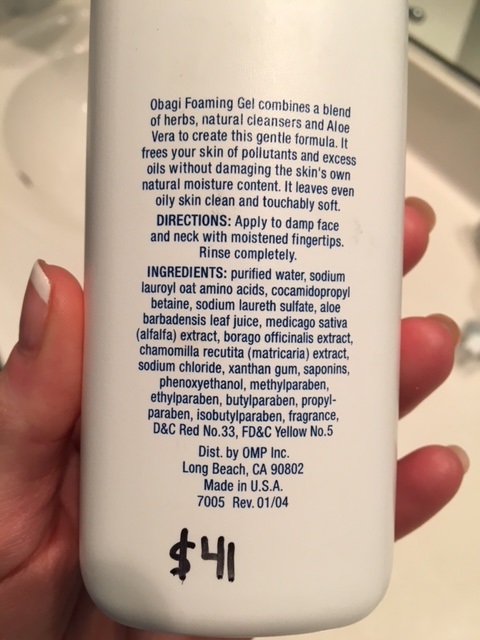 Obagi Nu-derm Foaming Gel Cleanser Review – Too Many Chemicals? 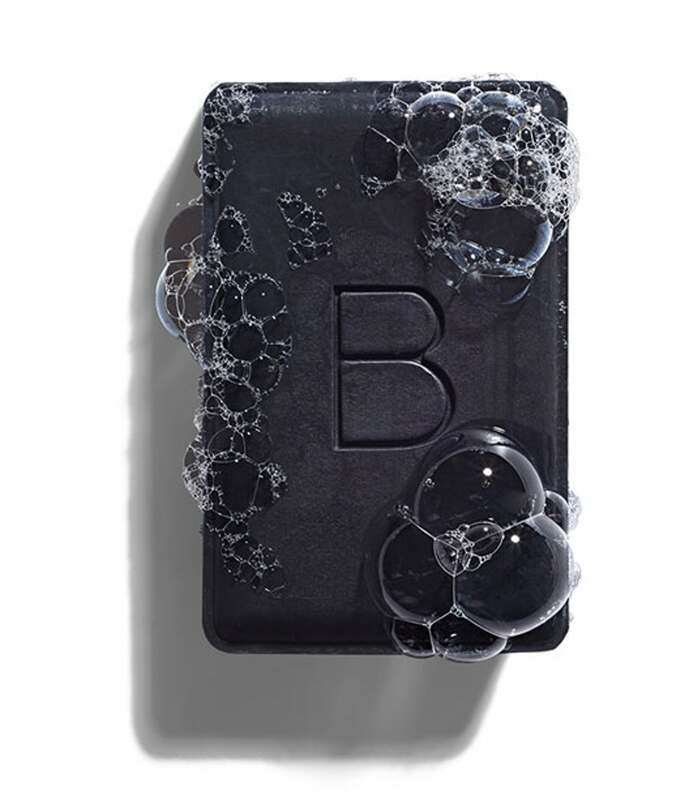 Obagi’s Foaming Gel Cleanser deep cleanses while leaving skin supple. Obagi’s Nu-derm line is said to be the #1 physician-dispensed skin care system that helps to correct and improve visible signs of skin aging, and will transform your skin. Step 1 of the Obagi Nu-derm system is the Obagi Foaming Gel Cleanser. 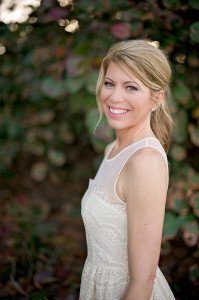 Before my wedding, I decided to try the Obagi line after I received a very light “wedding day brightening” peel from a local plastic surgeon’s office. Not the type of peel that makes your skin peel off, it was just a super gentle treatment. 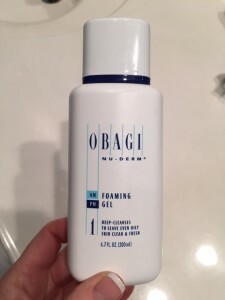 My Dr.’s office recommended Obagi’s Nu-Derm Foaming Gel to be used as my daily cleanser so I decided to give it a try. The bottle says it’s gentle, and would remove excess oils without stripping my face of its natural moisture content. 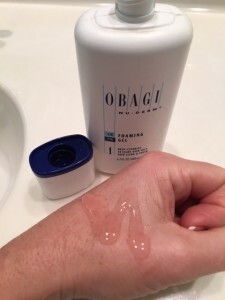 Obagi’s Foaming Gel Cleanser foams up into a nice lather and has a light, sweet smell. 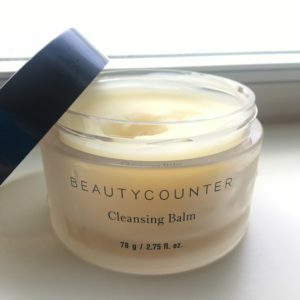 I used this product exclusively for about six weeks, and went through an entire 6.7 oz bottle of the cleanser prior to writing this review. I actually really liked this cleanser! It left my skin feeling clean and fresh, yet my skin still felt supple. So they were correct when they said it would not strip my face of its natural oils. The gel has a pink tint to it when you look into the bottle, but it pretty much looks clear once you dispense it into your palm. Mixed with just a little bit of water, it foams up into a nice, frothy lather and has a light, sweet scent. The instructions say to use it both AM and PM, which is exactly what I did. I used it to cleanse my face, neck, and chest. I did not use this cleanser on my eyes since it has added fragrance. I have extremely sensitive eyelids and usually fragrances or botanical ingredients cause my eyelids to be puffy and red. But if you’re not super sensitive, then you may not have an issue with this. One thing I didn’t pay close attention to until I was almost completely done with the bottle were the ingredients. I was pleased to find it contained aloe leaf juice and chamomile extract, which explains why it’s gentle on the skin and feels calming. However, I was really surprised to find that it contained 5 different parabens, which are preservatives that have a bad wrap in the beauty industry, along with phthalates (added fragrance). If you’re totally against using skin care products with preservatives or fragrances, then the Obagi Nu-Derm line is not for you. But do parabens really deserve a bad wrap? The reason so much of our skin care contains parabens is to keep the contents fresh and keep bacteria and fungus from growing which could be harmful to skin, eyes and mucous membranes. There is a school of thought that parabens can have an estrogenic affect and be an endocrine-disrupter and even be a cause of breast cancer, but like any argument, there are two sides to the story. 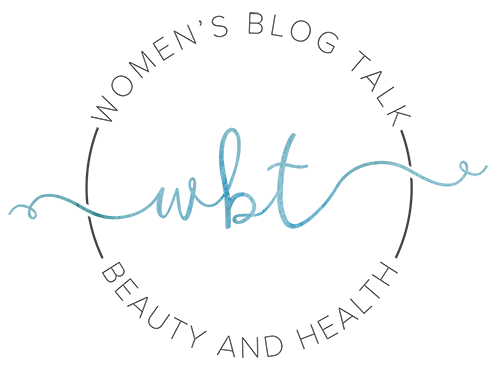 Most beauty products that we use today do contain parabens and pthalates, and many believe that PARABENS, especially in the small amounts used in personal-care products, do not pose a significant health risk. To me this is a personal choice. Some people like all natural, organic skin care with no parabens and no phthalates, and others don’t mind it. Personally, I don’t mind it being in a face wash, or any product that I’m washing off completely with water such as a body wash. 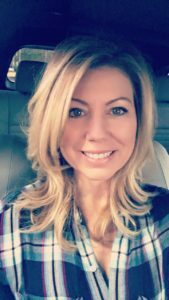 I will say that after I was married and we were trying to conceive – I stopped using ALL beauty products with parabens and phthalates (fragrance), because I was told by my fertility Dr. that I should avoid those for the time being. So it appears I paid top dollar by purchasing the Obagi cleanser from my Dr.’s office where I was charged $41. You can purchase this cleanser for $22.50 from Amazon but I also found it on DermStore for $42! That’s a pretty significant price different, so definitely shop around if you decide to purchase this product. 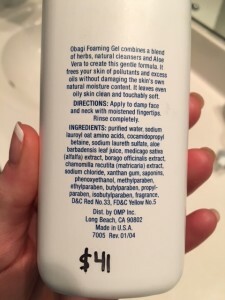 I did enjoy using the Obagi Nu-Derm Foaming Gel Cleanser, and it always left my face feeling soft, supple and perfectly balanced and didn’t strip my skin. If you have problem skin, and happen to go visit your dermatologist and they recommend the Obagi Nu-Derm line, I have no doubt it would be a fantastic skin care line as it has really good reviews! However, if you’re partial to using products with parabens or pthalates, then this product may not be for you. 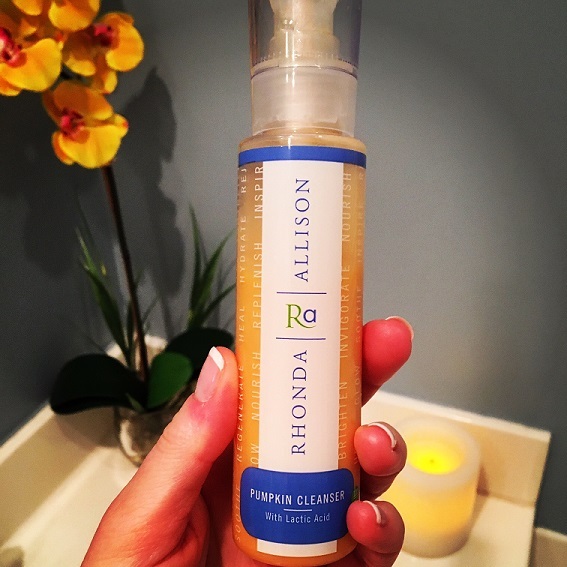 At the high price point, I don’t think I would ever repurchase it since the cleanser I’m using now has no parabens, no phthalates, leaves my skin amazingly supple, and I can even use it on my eyes! 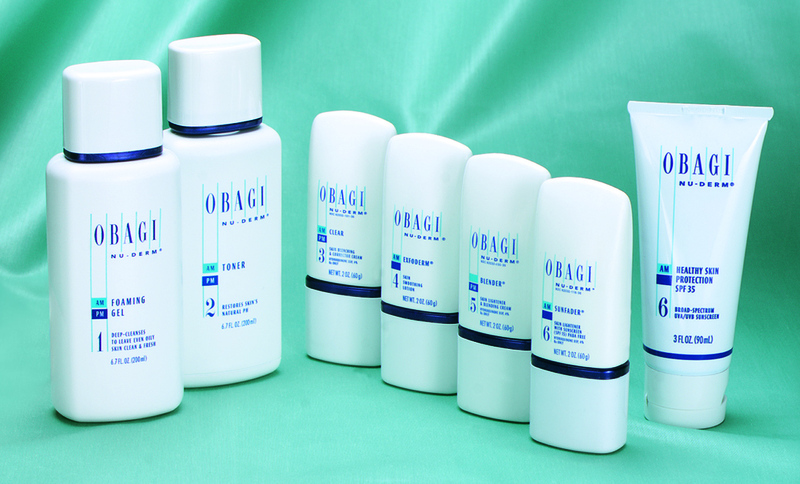 Have you used Obagi’s Cleanser? Leave your comments below! Cleansing Balm melts into your skin to hydrate while it cleanses, removing makeup and other impurities but never stripping away moisture. With vitamin C to brighten the appearance of skin and raspberry and cranberry seed oils to hydrate, the formula can also be used as an intensely nourishing face mask. All natural, no chemicals. 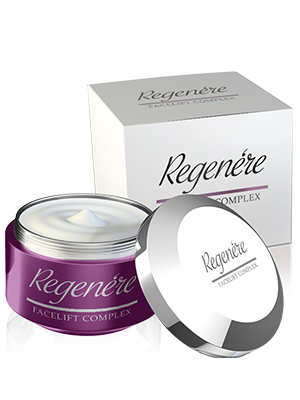 Regenere Facelift Complex Review - Clinically Proven or Scam? 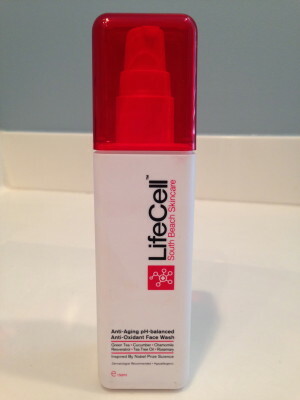 Radian-C Anti-Aging Cream and Eye Serum Review - Hollywood Secret or Scam?